Babycare chain Mothercare has posted a 12% rise in half-year profits, as its overseas revenues offset a "difficult and volatile" UK retail environment. Reporting its results for the six months to 14 October, the retailer made a pre-tax profit of £12.8m ($24m), up from £11.4m a year earlier. Its UK sales during the period rose 2% to £220m, while revenues from overseas franchises climbed 28% to £44m. Mothercare's total half-year revenues were up 5.6% to £264m. Like-for-like UK sales - a measure which strips out the sales impact of new stores - advanced by 1.9%. Mothercare now has 307 international stores across 38 countries, opening an extra 32 overseas outlets during the six months to 14 October. 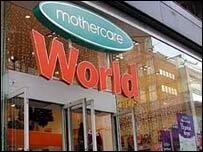 "The UK business has performed well in what remains a difficult and volatile trading environment," said Mothercare chief executive Ben Gordon. "We are delighted with the performance of the international business. "We expect international to continue to grow strongly and despite a challenging UK market we believe we are well placed as we look to the second half."